Production Company: Educational Films Corporation of America. Director: Robert C. Bruce. Transfer Note: Copied at 18 frames per second from a 35mm print preserved by the Oregon Historical Society from source material provided by EYE Filmmuseum. New Music: Michael D. Mortilla. Running Time: 12 minutes. Robert Cameron Bruce was an apple grower turned scenic filmmaker. Originally from Vermont, he’d come west and launched a commercial apple orchard in White Salmon, Washington, around 1910. After a bad harvest in 1914, Bruce turned what had been an avocation—photographing Pacific Northwest scenery—into a full-time pursuit, branching out into filmmaking. With much to learn, he hired Jesse G. Sill from nearby Portland, Oregon, as his cinematographer. The Illinois-born Sill (1882–1981) had kicked around the Northwest for about a decade before settling in Oregon. He’d begun filmmaking in 1912 and by 1914 was shooting industrials and local news. 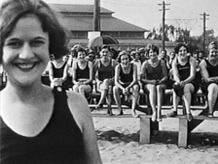 Bruce distributed the initial production, When the Mountains Call (1915), through Katherine F. Carter, a New York promoter of educational films. Depicting Mount Adams, Washington, and the Columbia River Valley, the film was a critical and popular success. By 1915, Carter’s enterprise had grown to become Educational Films Corporation of America, which commissioned more Bruce scenics. Topical films highlighting specific global locales were as old as the medium itself. Since images of waves crashing on the beach at Dover, England, appeared in the earliest commercial screenings, scenic topics abounded. Railroads advertised with views of their territories, Burton Holmes and Lyman Howe toured with programs of foreign destinations, and most major film companies regularly issued split- and one-reel scenics. In 1915, a Northern Pacific Railroad slogan, “See America First,” exploded into a patriotic national catchphrase that found film expression through a series of domestic scenics on split reels distributed by Gaumont under that title. Within this context, Bruce began a scenic filmmaking career. Bruce’s films were distinguished by his conception of a scenic. While most were content to show a famous place or a geographic feature, Bruce looked more closely and tried to give the viewer, through innovative angles and perspectives, a singular impression. To this he added a human story element, often humorously. In most scenics humans were unseen or incidental. Viewing a scenic meant seeing some place an average audience would never witness in person. That was usually the sum total. Bruce gave the genre new dimensions. His approach also expanded the range of locations. Traditionally, the primary lure for an audience was name recognition, such as the pyramids of Egypt. But for several years Bruce filmed only in the Pacific Northwest, chose subjects based on their beauty, and structured his films with nominal stories. This was true from his first film, which concentrated on hiking in the relatively obscure Mount Adams region. The Snows of Many Years was one of 8 to 10 topics made during the summer of 1916. Bruce and Sill spent early June in the Columbia River Gorge and then trudged through the Olympic Peninsula in Washington for several weeks. After venturing north to Lake Chelan and Snoqualmie Falls, they joined the Mazamas, a Portland hiking club, on an excursion to Oregon’s Three Sisters mountains. Late August found them on Mount Hood. In typical style, Bruce filmed The Hermit of Hood, a semidocumentary on the work and life of Elijah “Lige” Coalman, a renowned Mount Hood mountaineer who assisted and rescued climbers and scanned the surrounding terrain from the mountaintop for forest fires. Bruce and Sill remained on Mount Hood to shoot The Snows of Many Years on Sept. 1 or 2. Bruce was inspired by the impressive and varied features of Eliot Glacier, the largest on Mount Hood. He gives the film a basic human story, opening with three hikers leaving Cloud Cap Inn, a quarter mile from Eliot Glacier. As titles describe the glacier’s dimensions and features, the hikers provide a human scale and feel. Eliot Glacier is partially disguised by a coating of dirt and rocks; an early scene shows a hiker picking through dirt to reveal ice underneath. A deep crevasse becomes dangerous when a man lies prone and peers over the edge. Audiences know how big an ice tunnel is, or how tall a serac, when someone crawls through or climbs it. The hikers are unidentified, although the lanky Bruce, with glasses and mustache, is easily picked out. The leader, in suspenders, resembles Coalman, Bruce’s recent collaborator. There is also implicit evidence that Bruce was learning cinematography. For three short scenes in the waning minutes, Bruce disappears and is replaced by a man in a fur-fringed coat. This is probably Sill killing time while Bruce borrows his camera. Done exploring formations resulting from the accumulated snows of many years, the trio walk back in through the door of Cloud Cap Inn. The Snows of Many Years was preserved in 2015 at Colorlab Corp using a tinted 35mm nitrate print from EYE Filmmuseum. The intertitles were translated from the Dutch and are modern recreations. The work was supervised by the Oregon Historical Society and funded through a National Endowment for the Humanities grant secured by the NFPF. The new music for this presentation was composed and performed by Michael D. Mortilla. Michael has been composing professionally for more than four decades and has accompanied silent film screenings throughout the United States. Among his many NFPF projects are the accompaniments for the DVDs Treasures 5: The West and Lost and Found: American Treasures from the New Zealand Film Archive.